This article is a summary of the presentation talk by Clwyd Probert from Whitehat at the HubSpot User Group Meeting in June 2018. The full transcript of the talk and the video presentation can be seen by following this link. Every businessman knows the truth: you can have the best product in the world, you can assure the best price in your industry, you can have hired the most effective sales reps ever, but… nobody will buy something from you if they don’t succeed in finding you! The good news is that you can rank on the first Google search pages thanks to an efficient SEO (Search Engine Optimisation) strategy. The bad news? Most of the people don't really know how SEO really works. But we have a solution for you: we’re about to explain how to rank higher on Google and how to create the piece of content that Big G definitely loves: the pillar page. And don’t worry: Whitehat has been doing SEO since 2005, so we're kind of good at that. The other thing that is hard to do for most of the marketers is coming up with ideas in order to create really good authority content. Yes, we know: there's so much noise out there, it's difficult to rise above that. But there’s a solution: authority content. So if you ask yourself: “How do I get found on Google? How do I get seen? How do I get traffic to the site?” Just let’s continue reading. 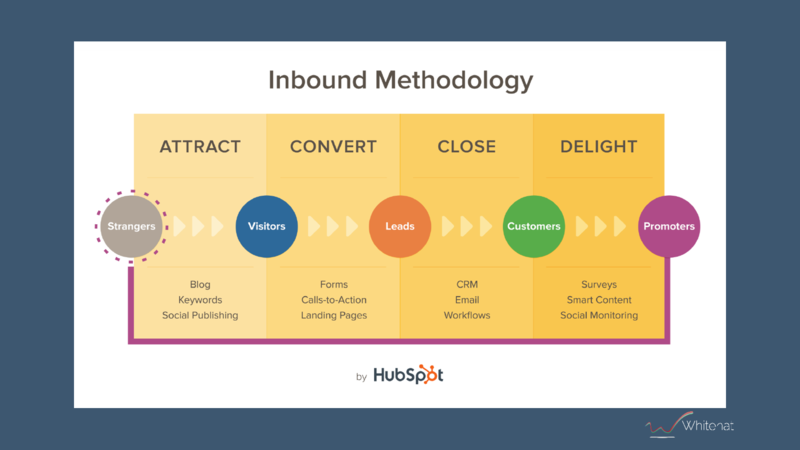 To understand why Search Engine Optimisation is so pivotal, it’d better refresh the inbound marketing methodology. The process each and every company manage their customers consist of 5 different steps: attracting strangers and turning them into visitors on the website, converting them into leads, nurturing those leads until they become customers and finally delighting them up till they become enthusiastic promoters. But the magic starts with the first step: attracting. Unfortunately, there's a horrible statistic for anybody who creates content and works diligently on his/her blogs: over 90% of web content is never returned by a Google search. What does it mean? 90% of what you write will never be seen. It’s a pity! But don’t despair, there’s a solution: understanding how search engines do actually work. The acquisition process is divided into 3 steps. Crawling: the search engine spider looks for and eventually finds the content, hopping from web-page to web-page. 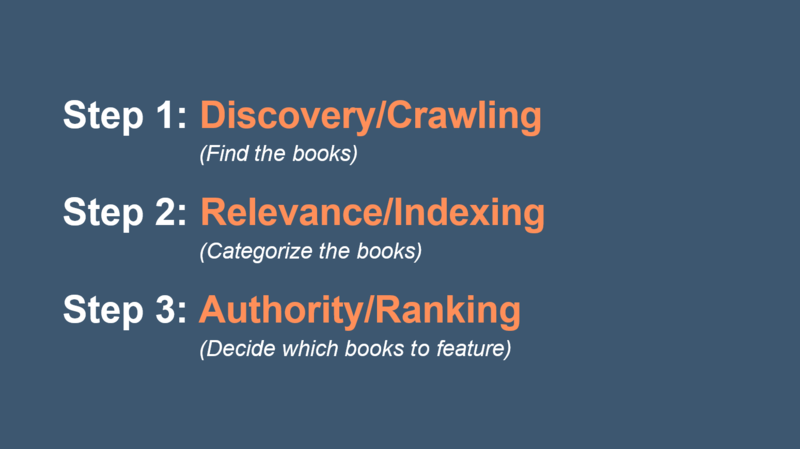 Indexing: is when it analyses that content, figures out what it's about and creates a real index of everything has been found. Ranking: is when the spider decides which result is qualitatively the best, out of all of the possible results, producing a descending list. It’s the most automatic of the stage. The search engine discovers all your pages and blog articles as long as they are published and not hidden from it. Be sure Google discovers you for a query that is genuinely related to your topic. You must pay attention to the technical (and still important) aspects (i.e adding the right keywords, the meta-tags, a proper title, naming the images you insert in an efficient way, giving the page the correct URL). But that’s not all. If it's not thin content (Google is fond of long content). Another important thing to consider: you shouldn't publish stuff that is not relevant to your business, even if it’s trending. At the end of the day, Google is still an algorithm (although clever!) and you've got to help it to understand what you want to be known for. A long structure: The average length of a blog post produced today is probably around 400/600 words in length, but articles that gain the first page on Google have a 1500-word length. Furthermore, the average length of a page in the first 3 Big G results is 2500 words. What’s the bottom line? You need to produce long-form content. It’s better to produce 1 really good long piece of content instead of 5 or 10 shorter pieces. Being authoritative. After all, a long-form content is not necessarily an excellent one, and Google knows it. For that reason, backlinks are essential for its algorithm in order to determine how important your page is for the users. 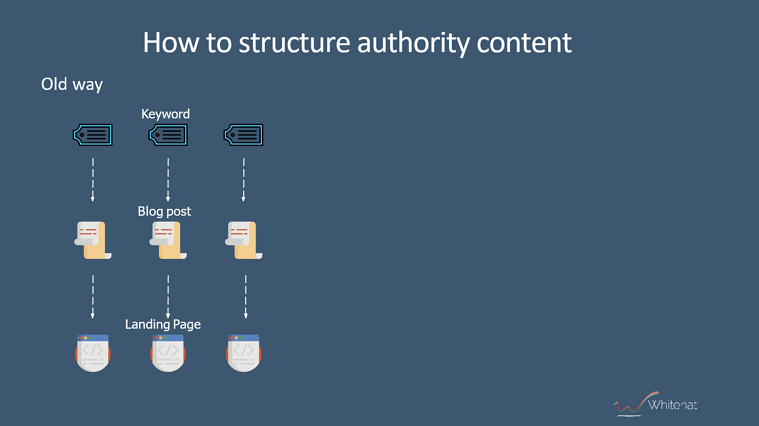 Once you've built up your own authority, you will start ranking for the content that you've created on your site. Let’s see in the next chapter how to build an authoritative text. Long ago, one of the most important aspects of SEO was the keyword. Everybody used to put the keyword they want to rank for on the title of their article, on the copy for several times, on the meta-tags and so on. All this is still pivotal for your SEO strategy, but there’s something more important now: the pillar page. So what? You must change the way you compose your articles. 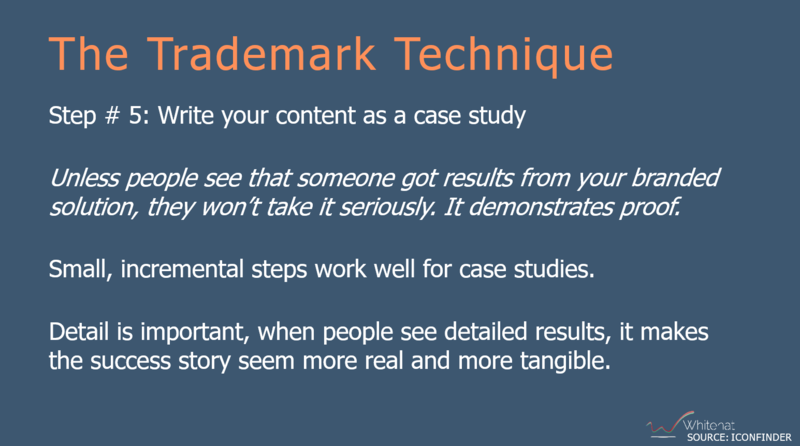 then for that keyword you would write a blog post and then you'd write another blog post for a very similar keyword. For example, if you had an Italian restaurant in London, you would publish a blog post based on the keyword “Italian restaurant in London”, a second based on “the best Italian restaurant London” afterwards, then “Italian food in London” and so on. Google was focused on individual keywords and you could only really rank 1 page for 1 keyword. The bottom line? You needed tons of pretty much identical ones. Today things are changed. Aren’t you sure about it? Let’s analyse an example. If you google “Football clubs in London”, you will obtain results as the Arsenal portal, the Tottenham one and so on. Now hit on a team website and you will probably notice that the keyword “football club in London” is not mentioned anywhere (not in the home page title, nor in the pictures title etc.). How can Google know what the site is about? Google is inferring what you actually want to read about, not providing you with an exact keyword match. So stop being obsessed by keywords and start thinking about topics. Nowadays Google has a priority: the user experience, that has to be as pleasant as possible. So now the best thing you can do is writing 1 authoritative piece of content, that contains all your knowledge and all of your experience about a general topic (your core business). Be detailed. Another important thing: make the pillar page linkable from the home page, make it part of your site structure. Each and every company has to figure out who are their buyer persona. They are important not only for selling your product in a most efficient way, but for SEO as well. 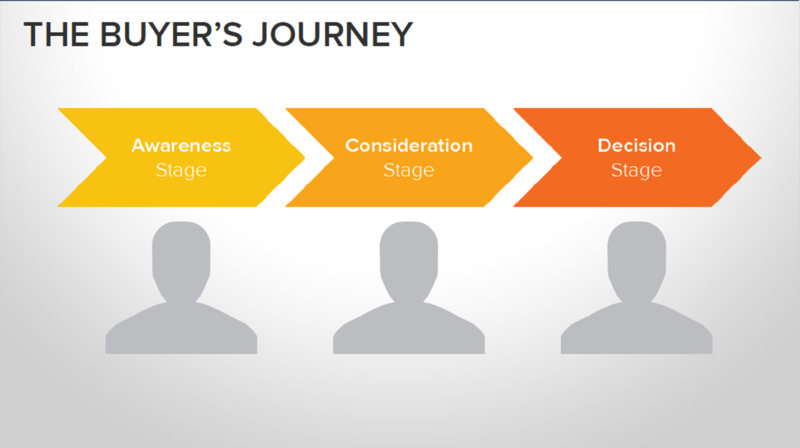 In fact, your buyer personas go through different stages before buying from you: it’s called the buyer’s journey. So the personas use different search terms to find a solution to their problem. You have to discover what those terms are. How often should you publish a post? The most part of all SEO campaigns usually have a weak spot: they are focused on producing tons of contents. This is no more useful. This is how we did things back in the days. Today there is no correlation between the frequency of posting and Google ranking. If you don’t have authority, it doesn't matter if you publish twice a week or twice a quarter. So if your company is already well established, if you’re well known, if influencers are already linking to you, you can focus on creating more content. 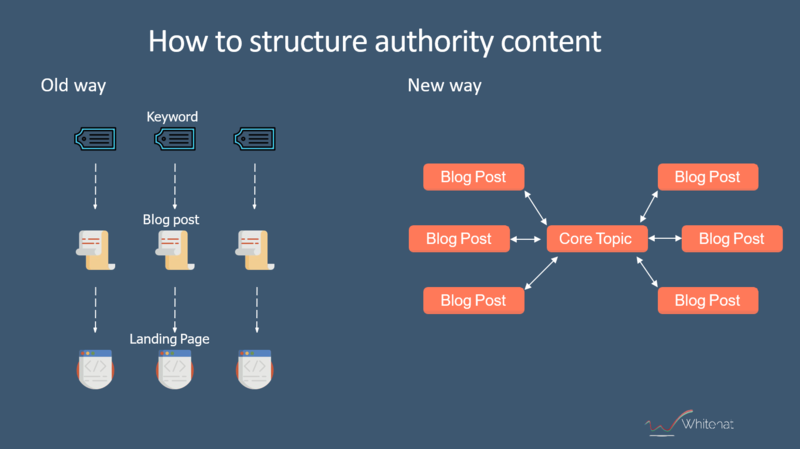 But if don’t have a good ranking on Google or if you work for a start-up, change your way: don’t publish tons of content, just start building authority. and if your website isn't credible, then it has little chance of ranking, no matter how relevant it is. It’s better to be clear: this is the step that most people actually fail. The reason is easy to say: they leave to fate the back-links construction. Let’s take a step back. Why are back-links so important? 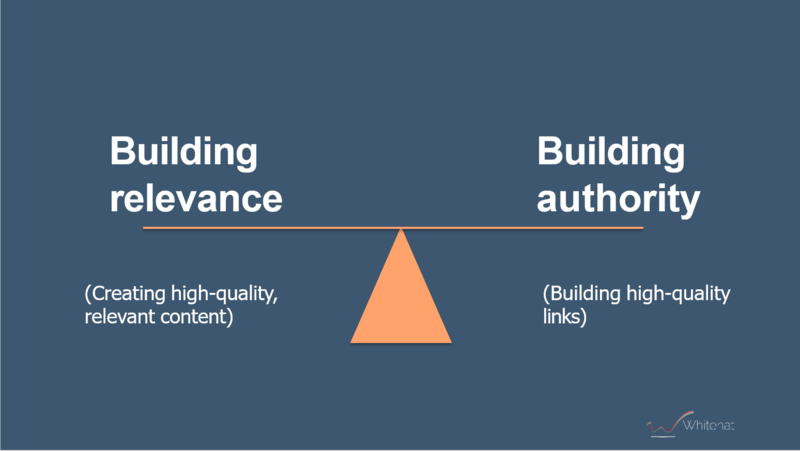 You don't hear very much about building authority in terms of quality back-links, we know. But obtaining quality back-links from authoritative websites is the only way to get results from an inbound campaign in a few months instead of 2 years. When you do this, it's also important to keep track of your backlink profile to make sure that it appear natural to Google and tools like Linkio can help you track that. To make it easier to understand, just think about a bookshop or a library. You must organise all the volumes you own in a defined order: how will you classify them (apart from by author and subject)? How can you determine which books out of all that to feature and which one is likely to become a best seller? You’d probably choose them analysing their authority. A book is authoritative if it’s cited in other newspaper or academic journals, and the most citations that it gets, the higher qualitative it is. So if you translate that to a web environment, then those citations translate into links. reaching out to the influencers. The starting point is simple to identify: high-quality content. High-quality content is the key for getting high-quality backlinks. 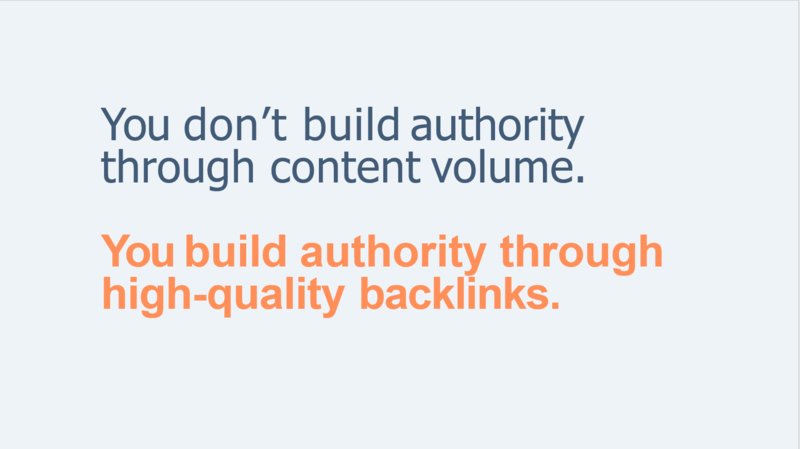 You don’t build authority through content volume indeed, you build authority through high-quality backlinks. 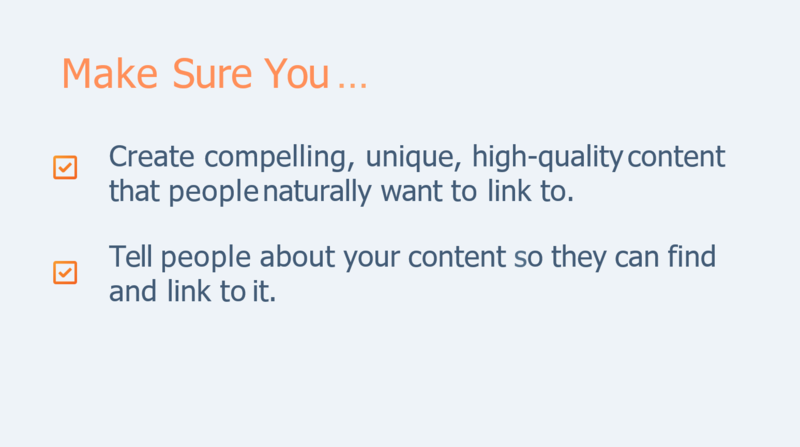 Think about it: remarkable content is something that other people will link to. But pay attention: your aim is to get backlinks, so you must NOT produce content targeted only at your classic buyer personas, because they don't have authority websites in most cases. Obviously, your personas are still important (as we said in chapter 2): at the end of the day, they will buy your products. But in order to rank higher on Google - and so get more visitors, prospects and finally customers (remember the inbound methodology scheme in chapter 1?) -, the best things to do is targeting a large portion of your content at your “linkreators”, not at your buyer persona. It’s hard to write down all your expertise on a web-page, we know. You haven’t much time and writing is a tough stuff. But there are some tactics to make it easier. If you have a team in which you trust, don’t ask them to compose a 3000-word blog post – they will never do this! –, just let them speak about their job. 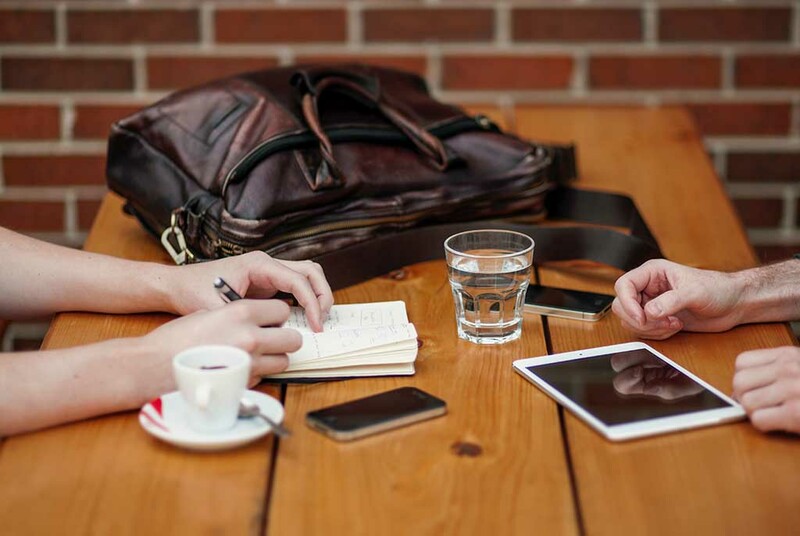 Offer a coffee or a beer to them, sit them down in front of a smartphone – and make the interview start. Let’s video the conversation or record the audio and then transcribe it. Because people are happy to talk. They're not happy to write. Interview your customers or interview some experts in your industry in the same way you did with your colleagues. If you are in a medium or big company, you can also take into consideration to run an event (a conference, a meeting, a workshop or something similar), in which you show your insights into the core topic. Record the speech and then transform it into an article, an eBook, a podcast, a webinar and so on. Do you realise the volume of content you can extract just from your team? If you have a low budget, you don't need to hire an outsourced copywriter. As we said, you should create content for the influencers, somebody who is an authority in your industry and who blogs about what you do. Nevertheless, this is just the first stage. Hit “publish” after you’ve composed a pillar page is not enough, sorry. you promote it on social media, like Twitter, Facebook, LinkedIn, Instagram and whatever. That’s all. But in reality, you haven’t started to promote your content yet. So what’s the second step to take? Outreach to your “linkreators”. This is so important that it’s often misunderstood: you need an entire campaign to get people to see that. Maybe you’re thinking: “I can send the article out through my emails list”. Yeah, you could, but that email list is people that already know you: you wouldn’t attract new prospect this way. talk to them (through an email or a call) and explain why your piece of content will blow them away. In the early days of SEO, it was quite easy to rank high on Google, because it just took to have tons of backlinks, no matter what the source was. So a lot of people went to an outsourcing agency and bought a million external links, getting their site number 1 overnight. Nowadays this strategy would be suicide. Yes, it’s true: you still need those links. But a big change happened in Google algorithm: today links are weighted, they have a different authority and it hits massively on your ranking. So if you have a link coming from the BBC, it counts much more than a link from your cousin’s website. Be careful: that backlink needs to be non-spammy, it needs to be 100% natural. 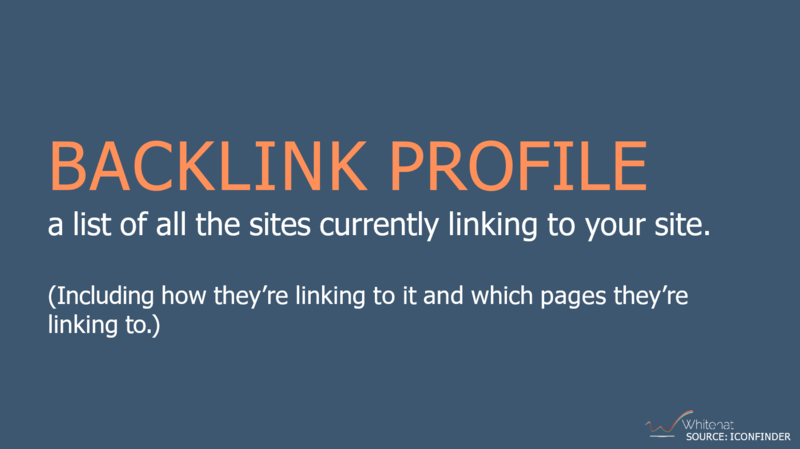 What is the backlink profile? Monitoring how many backlinks you gathered and who added a link to your website is pivotal in order to establish if your SEO strategy is working well. What do you need? A backlink profile. The number of unique domains that link back to you is very important to analyze because it would be great to get 50 links from the BBC, but if the BBC is the only website that links at you, it’s not so fantastic. Much better to have a more diverse split. 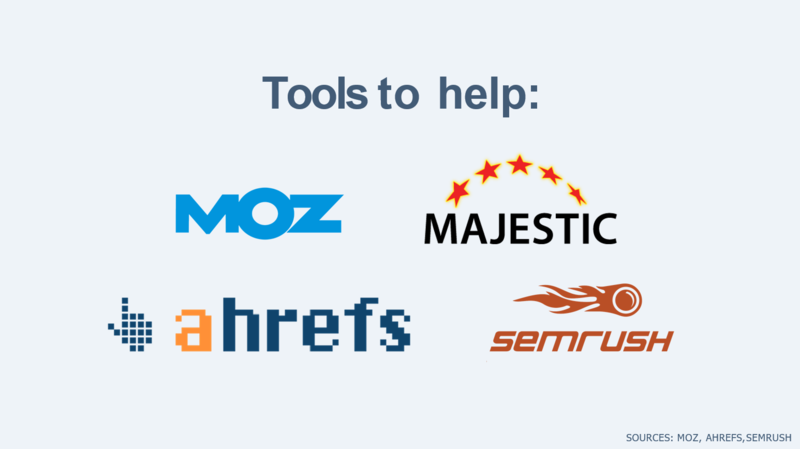 There are multiple platforms that give you a backlink profile, the most part is not free. 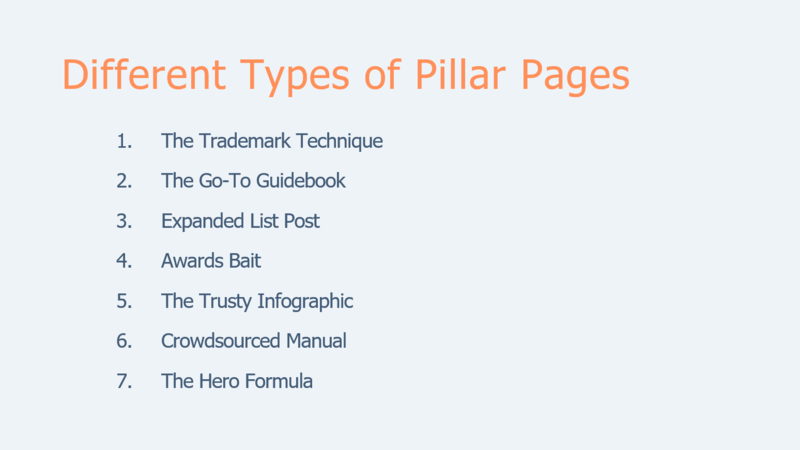 We made a list of ideas for effective pillar pages. But again, a brief recommendation. Before writing your first pillar page, you should take a step back: star researching your influencer, then figure out what's missing in your industry or what they might want to read. So create a content that's really targeted at them. It’s when you write a post about a problem your influencers have, showing a solution and branding that formula with a unique name (i.e. “The Pennies from Heaven Strategy”, “The Skyscraper Technique” etc.). 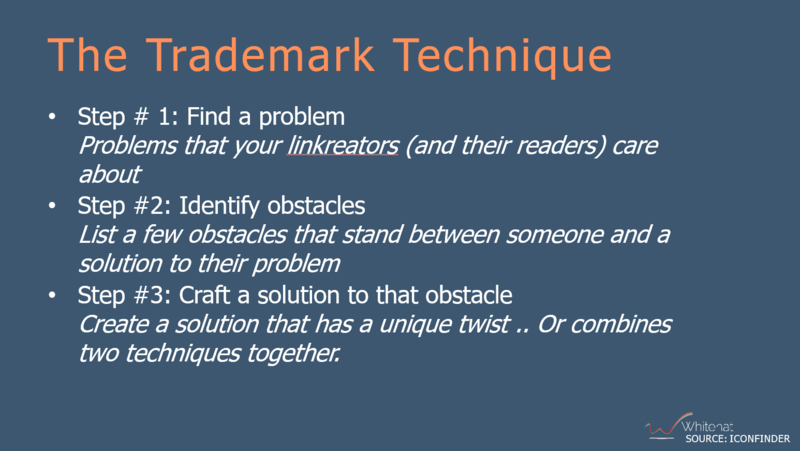 If you trademark something, people start seeing you as an authority. Are you scared you don’t have unique answers to give? Calm down: you don’t need them. You just need an exclusive recipe. It’s an all-inclusive guide about a topic you choose. That topic should be not too broad, but either not too specific. A best practice is to divide the text into chapters. List posts are one of the most liked content on the Internet because they are easy to read and remember. It’s a list post in which you award the best blogs/websites/CEO etc. in a specific field (e.g. “The best 20 travel blogs”). This kind of article is a very quick way to get backlinks: the people you mention in the copy will link to you for sure. Infographics are the most loved content users read on the Internet after the “How-to-do” posts. It gives you a unique opportunity to prove people you’re are an expert in your industry. Infographics have also a high sharing rate. It’s a guide in which different experts explain their point of view on a specific topic. This is a powerful way to create content not just for your influencers, but WITH them. Your audience can increase rapidly. 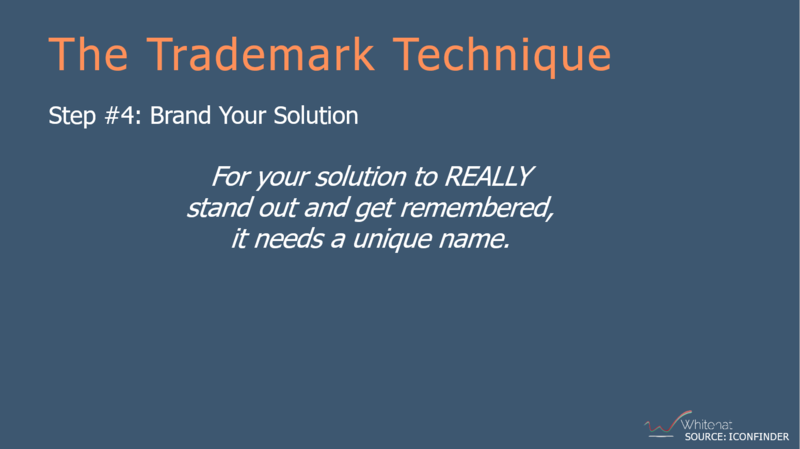 The trademark technique is useful to show people you’re an authority, the hero formula is the demonstration someone else succeeded in his/her business thanks to your help. Just figure out which customer could become a promoter for you and write his/her story as a case study. It seems not so painless to optimise your ranking on Google, right? It’s true, but if you put into practice the following procedure, you can be successful. 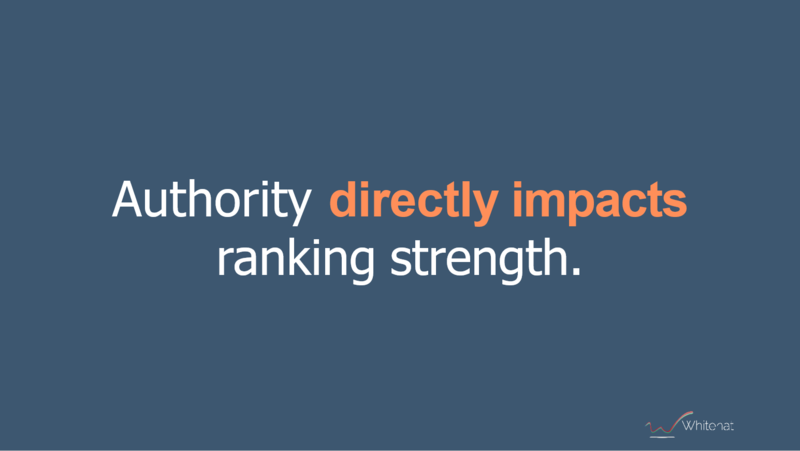 Send out the authority content to the influencers and get as many backlinks as you can. 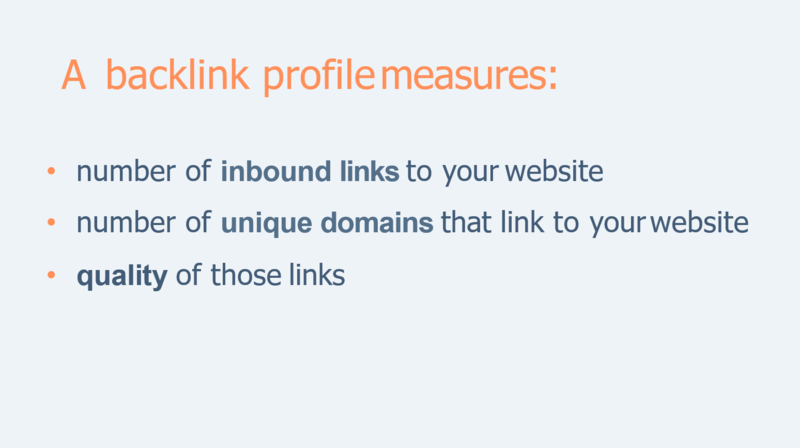 Keep track of your goals through a backlink profile. Another (and easier) way is to outsource your SEO strategy to an expert inbound marketing agency. 3. 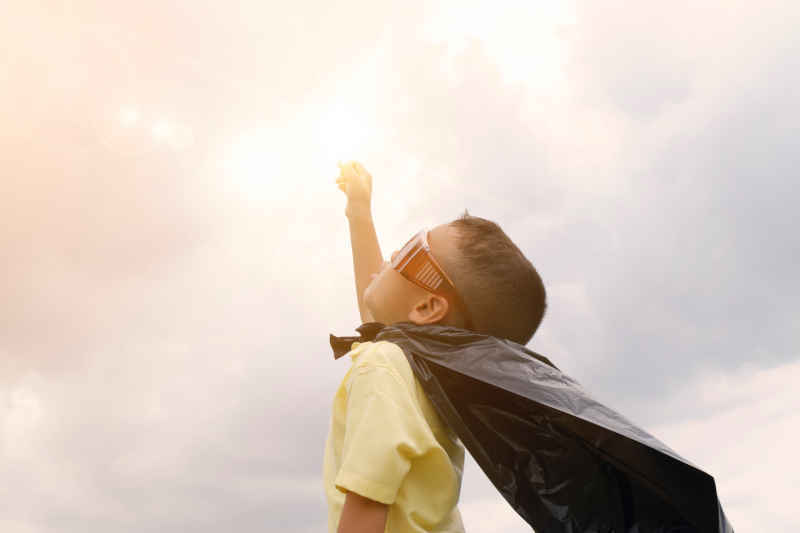 Read our eBook How To Build A Better Qualified Lead (And Win The Game At The Mid-Funnel).